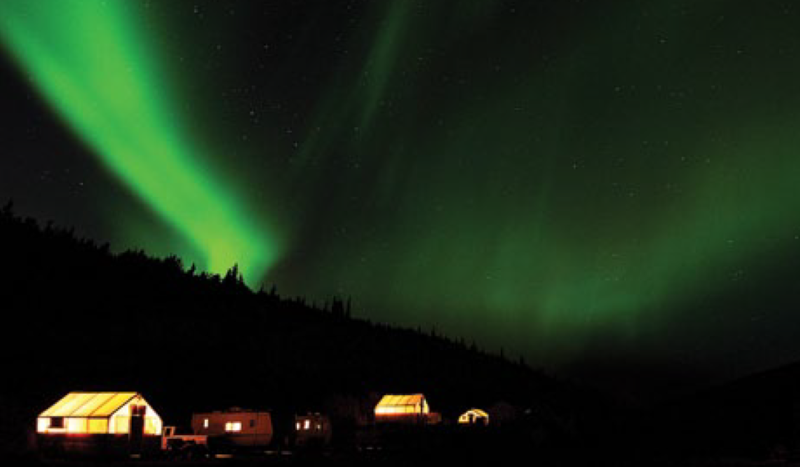 The Northern Lights in a summer sky over the base camp for mineral exploration located at Eldorado Creek in the Klondike region of Yukon. Photo by Dave Delnea, courtesy of Klondike Gold. When the Klondike gold rush began in Yukon in 1898, the resource potential of Yukon was largely unknown. Yukon now has more than 80 mineral resource deposits, 2,600 mineral occurrences, which cover only 3.6% of Yukon’s total area, and has developed three major mines in five years (the only place in the Western world to have done so), making this an international destination for prospectors, miners and developers. While Yukon is currently seeing what many have argued is its second gold rush, led largely by famous prospector Shawn Ryan, the most developed of Canada’s territories also hosts noteworthy deposits of silver, copper, tungsten, molybdenum, nickel, lead, zinc, iron ore and coal. In 2011, exploration expenditure reached $300 million, the highest ever seen in the territory, while 2012 is seeing more in-depth and detailed work done with some estimates stating that exploration expenditure will account for $200 million in 2012. “A lot of our Chinese clients are seriously looking at getting involved in the North. One reason they are attracted to Yukon in particular is because of its location in relation to China,” said Brian Abraham, Q.C., partner, Fraser Milner Casgrain LLP, referring to its strategic shipping transport route. There is also the matter of logistics. Many remote mining exploration sites in Yukon, even with its highly developed infrastructure, require air cargo solutions. The problem: privatized runways tend to be underdeveloped or not particularly well maintained which leads to higher operating costs. “There are only two paved runways in Yukon; we therefore have to have aircraft capable of landing on gravel runways. These gravel runways could be longer and are payload restricted. All of these things tend to increase the cost of providing a product because they restrict us from introducing new fuel-efficient aircraft as they cannot land on gravel runways,” said Joseph Sparling, president of Yukon-based Air North. “We currently require fly-in capabilities as our camp is located on the side of the Nahanni Range road which services an operating tungsten mine to the north. The helicopter flies our crew and supplies in daily, flies them out, transports the rigs and so forth; a third of the costs at least goes towards supporting this fly-in,” said Jim Pettit, president of Aben Resources Ltd.
With international eyes again focused on Yukon, one man can largely be credited with its revival. To those outside of Yukon, Shawn Ryan is unlikely to be a familiar name. To those who currently have their sights set on Yukon, however, this humble prospecting extraordinaire may very well be responsible for shaping the current mining boom the territory is seeing. “Yukon missed out on the gold boom of the early 1980s, but was placed back on the map through the efforts of Shawn Ryan, prospector, and ATAC Resource’s gold discovery, with Yukon’s exploration expenditure now topping $300 million per year. Yukon will not go back to the sleepy backwater that it once was,” said Mark Fekete, president and CEO at Stakeholder Gold Corp.
Shawn Ryan, who was originally drawn to Yukon for commercial wild mushroom picking, has refined exploration techniques that have arguably largely driven this boom. “In 2001 we introduced our own deeper soil sampling technique … This enabled us to better understand the terrain. Between 2004 and 2012 there have been 350,000 soil samplings on my various claim blocks; all these samplings were financed by junior exploration companies,” said Shawn Ryan. Having now optioned out over 100 projects in the last seven years, it seems this man may have the Midas touch. Shawn Ryan discoveries, or how Yukon exploration season works and this made Yukon less attractive,” said James Corrigan, president, Stina Resources Ltd. The interest gained by Ryan’s work has also brought significant business to local Yukon support companies. “The White Gold project, which involved Shawn Ryan as prospector, started with [Great River Air] flying four soil samplers in a Cessna to and from the field site; the next year there were 20 men, requiring a bigger aircraft, and it has developed from there. Kinross now owns the property and we are supporting the 300 personnel purpose-built camp accommodation,” said Eric Rieder, head pilot at Great River Air. For cynics, one recent discovery has returned those wandering investor eyes back to Yukon. A Comstock-Shawn Ryan project, the QV property, is the latest find. “The continuous new discovery of orebodies in Yukon …is a silencing response to any skeptics [of Yukon’s continued potential],” said Shawn Ryan. With a mining framework that is generally praised by those who operate in the territory, there are a number of key points that make Yukon such an attractive operational climate: devolution, speed of permitting and settled land claims. “After working in many parts of the world, it is my view that the regulatory environment in Yukon is very good, easily understood, rigorous but with definitive timelines, and generally responsive to project pressures. Alexco would be the example of a company that was able to discover, prove a resource and move into a production within three years; there are very few places in the world where that can be done,” said Nauman of Alexco. The Yukon Environmental and Socioeconomic Assessment Board (YESAB), and its subsequent Act (YESAA) have also helped create a more streamlined process in the territory. Since 2005 YESAB has carried out 1,600 assessments. managed in Ottawa. This shift has played a huge role in allowing the mining industry to open up [in Yukon],” said Fekete. “Important to the environment is the 2006 Yukon Mine Reclamation and Closure Policy; subsequent to that is the financial strategy delineating the financial and technical guidelines required for mine reclamation and closure. The Yukon government continues to work with the mining industry, providing companies with facilitators to assist them through the assessment and regulatory processes,” said Premier Pasloski. Land use planning is another key consideration in Yukon. “Trying to fill the gap of the incomplete Land Use Planning process is a challenge for all proponents of the industry… This process should be completed as soon as possible to assist the understanding of potential use, and acceptable thresholds in specific areas of Yukon; the Land Use Planning process would be a very useful tool for YESAB,” said Stephen Mills, chairman, YESAB. While the system may be a great improvement for those entering the mining sphere in Yukon, those who are more established face certain hurdles. “The current assessment legislation and guidelines in Yukon are not particularly well suited to the expansion of existing mines; they are effectively treated as brand-new projects creating a great deal of seemingly unnecessary additional work and permitting delays in order to clarify the exact scope of an expansion project versus pre-existing and pre-authorized facilities,” said Scott Keesey, environmental manager at Access Consulting Group. The Yukon staking system has also been a point of contention for some in the industry. “The system is a little antiquated. Arguably, it would be a positive step if we adopted British Columbia’s online staking system,” said G.C. (Carl) Friesen, vice president, Underhill Geomatics Ltd., Underhill and Underhill. Overall, Yukon has proved it is taking the initiative to make its regulatory regime welcoming to the mining industry. For a population of just over 35,000, Yukon boasts some of the region’s most developed infrastructure. With 4,700 km of all-weather roads, 11 airports, comprised of 10 regional and one international, access to two ice-free ports and a territory-wide broadband telecommunications network, Yukon is prepared for the mining community. The one critical area to watch as Yukon’s mining industry continues to develop, however, is power. With an aged power infrastructure, a grid that is currently running at near capacity, and no clear means of increasing this power supply, mines that are looking to come online in the near future face critical issues. electricity utility (Yukon Electrical Company) has plans to extend a spur line from Carmacks to that property which would give us an even closer conduit to grid power,” said John Burges, president and CEO of Northern Freegold Resources Ltd.
“Lack of power is a major issue for Yukon; fortunately our properties are located near the Whitehorse to Dawson highway where we could potentially run a line to a power source, plus the second largest power plant in Yukon is on the western edge of our properties,” said Tony Simon, president and managing director YES Exploration Syndicate. Casino project]” said, Paul West-Sells, president and COO, Western Copper and Gold Corp. “We have been working with Western Copper and Gold that has the $1 billion plus Casino project for which it will alone require 800 gigawatt hours; way beyond Yukon Energy’s supply capacity… Yukon Energy and Western Copper and Gold are working together and sharing their expertise to determine if LNG is a feasible power supply solution …,” said Morrison of Yukon Energy. The private sector has been helping to fill this gap. “[In Yukon] neither the transmission lines nor the power lines are substantial enough to support the mines. Most mines will bring in power. Due to the remote locations of many of these mines, they may not have a power source already in place and this requires services like ours to ensure the exploration sites and mines themselves remain linked up and supported,” said Kevin Ross, general manager, NU-Line Powerline Contractors Ltd. The government appears fully aware of this problem and is currently pushing ahead with a number of initiatives. “Short- to midterm, we are moving forward with the independent power producers policy, with net metering, and, as a transitional fuel, with the use of LNG; Yukon government is putting in place the legislation and regulations for LNG,” said Hon. Darrell Pasloski, Premier of the Yukon government. There is already exploration underway to confirm the plausibility of this initiative. “Along with three other First Nations and the governments of Yukon and Canada, we launched an LNG study to supply energy to the emerging mining market …The partnership between the First Nations is called Dempster Energy Services…[If developed] our initial priority is the local market, but if there is enough energy to export we will consider this; China would be the obvious choice, given its role in production. Our project is driven by First Nations and is unlikely to see the same political problems plagued by the Gateway pipeline,” said Ron Daub, executive director of the Vuntut Gwitchin, a Yukon-based aboriginal corporation. LNG. Victoria Gold is the driver of our initiative, stating that it will require power by end 2014; we are endeavoring to work to this timeline,” said Morrison.